Reformation Review: A look at the origins of the European Reformations | J.W. Wartick -"Always Have a Reason"
The Reformation [I am going to use the term “Reformation” to refer to the European Reformations and the Roman Catholic counter-Reformation] is a period of extreme importance for those who seek to understand Christian theology. Many of the debates that are happening now can trace their roots to this period of history. One of the most important aspects to understanding the Reformation–and, by extension, much of the development of theology after the Reformation–involves looking into the origins of the movements. How is it that the Reformation started? What brought about the notion that it was necessary to reform the Church? In his Reformation Thought: An Introduction , Alister McGrath notes a number of aspects that are important for understanding Reformation thought. First, and perhaps most importantly, one must not limit reflection on the origins of the Reformation to any one cause. There were a diversity of social and theological causes which spurred the Reformation. The organization of cities was one factor that led to the success of the reformation. McGrath notes that individual cities during this period had come to regard itself as a kind of individual state. However, due to the failures of many of these cities to provide for their citizens and their growth over time, there were calls for a broader and representative government (McGrath, 16, cited below). Cities had become centers of power and experienced “remarkable growth” due to the various agrarian crises and plagues that had taken place in earlier years (Carter Lindberg, The European Reformations , 24ff, cited below). Furthermore, the control of the city council over the general practices and laws of the cities often led to a “symbiotic relationship” between a reformer and the city council. “The reformer, by presenting a coherent vision of the Christian gospel and its implications for the religious, social, and political structures and practices of a city, was able to prevent a potentially revolutionary situation from degenerating into chaos” (McGrath, 19). Some reformers were very tied to the social aspects of the reformation. 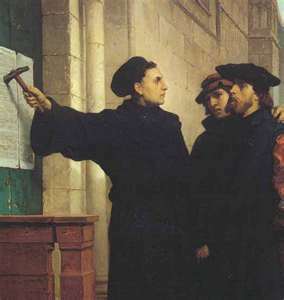 For these reformers, “the Reformation involved the identification of ‘citizen’ with ‘Christian’… Thus Zwingli laid great emphasis upon the need to reform and redeem a community, whereas Luther tended to concentrate upon the need to reform and redeem the individual” (McGrath, 20). One of the primary concerns of the reformers was that the Church could “best be reformed and renewed by returning to the beliefs and practices of the early church” (McGrath, 20). The reformers observed many problems with the Church of their time and felt that it was important to return to the “golden age” of Christianity, which they interpreted largely as the patristic period. There had been a growth in popular religion which was largely disconnected from that of the Church. “Folk religion” focused upon the “needs of rural communities–such as haymaking and harvesting” (McGrath, 24). A lack of confidence in the pope and the clerical system contributed to the need for reform. Furthermore, the laity was becoming more educated, which led to a problem for the Church. Due to the Roman Catholic church’s system at the time in which positions of authority would be given often to the highest bidder, there were many in the Church who never visited their parishes or had little interest in or understanding of that which they were supposed to preach. The educated laity became increasingly aware of the many errors even parish preachers would make in their renditions of the Latin in the Mass (some of these priests had merely memorized the service without understanding it themselves!) (24ff). Furthermore, throughout the Scholastic era, the Church had tolerated a kind of doctrinal pluralism. The Church recognized the need for allowing the academics to debate various issues, but this led to a serious question: “[W]hich of these schools of thought [theological schools of thought like Thomism or Scotists] was right?” (McGrath, 28). Yet the Church had suffered from a kind of schizophrenia about centralized authority. Was the authority in the Church found in Councils or in the Pope (Lindberg, 44ff)? Questions like these led to the need for reform. The reformers focused on who had the right to decide doctrine and the need for God’s word in the vernacular of the populace. There were two primary focuses for the individual reformers: the moral sphere and the doctrinal sphere. While it is necessary to avoid drawing a false either-or dichotomy between these, it is equally important to note that the various reformers focused largely one way or the other. Broadly speaking, several reformers in the Wittenburg/Swiss tradition focused upon the need to reform the very teachings and doctrines of the church, while those in the humanist (not to be confused with modern notions of humanism as atheism, but rather as a system of thought and practice) tradition focused upon the need to reform the moral practice of the church. Again, neither of these should be seen as exclusive of the other. Moral reform often involved doctrinal reform and vice versa. What must be emphasized, however, is that the reformers differed at points on whether it was more important to have right belief or right practice. Surely both thought both were necessary, but the question was how to integrate these into the Church and furthermore which should come first as important. Such differing emphases can be observed, for example, in the doctrine of Scripture. The humanistic reformers tended to see the Bible as a guide for morals, while the Wittenberg and Swiss reformers tended to see it as a “record of God’s gracious promises of salvation to those who believed” (see discussion in McGrath, 55-57). Thus, the stage was set for reform of the church. Societal and doctrinal pressures were in place that would lead to the need for reflection on the spheres of belief and practice. The debates that raged through the reformation continue to rage today. Throughout October and into the next few months (and perhaps beyond, depending on the feedback/readership I get here), I will be exploring various aspects of the Reformation. I will look at some important thinkers of the Reformation period and will also focus on some modern theology which can trace its roots back to the reformation. Why October [and beyond]? Well, Reformation Day is October 31st! Be ready to learn with me, and please ask questions and leave some comments! Alister McGrath’s book was a gift from an anonymous donor. I was blown away when I saw it show up at my door and I have to say Thank you so much for being such a blessing! Whoever you are, you made my day. Well, more than just one day actually. This series of posts is a direct result of your donation. Thank you! Alister McGrath, Reformation Thought: An Introduction (Malden, MA: Wiley-Blackwell, 2012). Carter Lindberg, The European Reformations (Malden, MA: Blackwell, 2010). J.W–just encouraging you to continue with your reformation analysis. As one who believes we are in a time of great ferment in Christian thought, driven largely by the slow but certain acceptance of scientific truth, it is very valuable for us to see that what we now understand as Christianity has not been fixed for all time, but is a result of very significant changes in culture, ideas, doctrine and philosophy over time. Keep up your good work. GBaron, is that to say it is possible for the nature of what we know Christianity to be to continue shifting with shifts in culture, etc? By the way, great blog. I love reading insight into believers’ perceptions of the balance of science and spirituality. Hello Andrew, I do believe what we know Christianity to be shifts with culture, our understanding of the natural world, etc. Of course, there are some solid underlying beliefs that do not change and cannot change for it to remain Christianity. The challenge is to know what is changeable and what must remain solid. It is one of the great tragedies of our faith history that too many have suffered horribly and died horribly over disagreements about those changes. I’m glad you went on to clarify your position in response to Andrew. I think it is very important to understand Christian doctrine as something based on certain core beliefs but subject to change and development over time apart from those core beliefs. But what constitutes core beliefs vs. non-core beliefs? Perhaps the answer to that is more obvious than I think. Things like the birth, death, and resurrection of Jesus Christ is likely a core belief that isn’t going to change over time. Which ones should, though? Or, which ones can? Andrew, that is a great question which has been debated by numerous thinkers throughout the history of Christianity. In fact, it is largely the subject of my next post on this topic: who gets to decide the core beliefs? How’s that for setting you up for coming back to read my blog? But I won’t be that mean: I tend to lean towards the notion that the ecumenical councils of the church have had the authority to declare correct interpretations of certain doctrines and draw those out in Creeds (i.e. the Nicene Creed). J.W., This is interesting and informative, giving us a better picture of the Reformation. Interesting! I will stop back to read the full post. I’m most interested in you continuing your analysis of the Reformation. In sending us into the world, Jesus prayed that we be one “so that the world may know that thou hast sent me and hast loved them even as thou hast loved me.” Divided, we send a confusing message to those who long for the truth about who Christ is & who has sent us. The exploration of that which tore us apart may well be integral to bringing us back together again. At the very least, it may help those of us who pray for the Church to be more specific. Plus, it’s extremely interesting! Please continue. Thanks for your kind words! Be sure to check out the other posts in the series (I have now updated this post with links to them).